Happy Father's Day from Nicki's Diapers! I’ll never forget the look on my husband’s face when I announced that I thought we should use cloth diapers with our first daughter. He raised his eyebrows, looked at me quizzically to see if I was joking, and when he finally realized I was serious, he said, “Fine by me. But I’m not washing them.” Fair enough. I had researched extensively before I made the proposal to him, and was armed with information to persuade him that I wasn’t insane. Quite frankly, I was shocked he didn’t put up more of a fight. As a high school band director in a large, suburban district, my schedule borders on insane. It is not unusual for me to have evening commitments at work 3 or 4 nights a week. My daughter was due in April, and I was taking the remainder of the school year off, but we knew I would be heading back to work the following August. The fall is my busiest time of year; marching band season means I am at work from 7am-6pm, with football games and festivals taking up nearly every Friday night and Saturday. I guess I wasn’t surprised, then, when friends and family questioned my sanity in adding one more thing to my never-ending to-do list. But, we did it. And quite successfully, at that! My daughter was cloth-diapered up until she potty-trained at age 2.5, including her time at a licensed daycare facility. (They thought I was nuts until they saw my awesome Fuzzibunz!) So when we found out we were expecting twins, there was no question that we’d cloth diaper again, and this time, my husband didn’t even bat an eye. The babies are almost 6 months old now, and have been happily in cloth since around week 2. I’m still working (though I’ve taken a hiatus from marching band—whew!) and we’re constantly telling our friends and family that if we can use cloth, so can they! 1. Invest for convenience. I knew that there was no way I would have the long-term desire to deal with pins, folding, etc. I wanted something that was simple and easy, even if it meant spending more money initially. When I started building a stash, I tried to find a good balance between convenience and cost-efficiency. For me, that meant fitteds and covers for the newborn stage and pocket diapers and AIOs for beyond. 2. Have a routine. In order for cloth diapering not to become a huge burden, you need to make the process a daily habit. When I first went back to work, I got into the habit of starting a load of diaper laundry right when I arrived home (if it was wash day). My daughter would generally fall asleep in the car on the way home from daycare, so I would just plop her carseat down in the kitchen, start a load, and then get to work prepping dinner until she woke up. I’d do the second wash after I got her down for the night, and then put everything in the dryer before I went to bed. 3. Keep it simple. It’s easy to get sucked in by all the online chatter about the best soap, most effective wash routine, or the latest and greatest diaper. My suggestion is to figure out what works for you, and then not mess around with it. While the appeal of using the highly recommended diaper-friendly, environmentally-friendly soap was tempting, I knew the first time I ran out and forgot to order online, I was not going to be happy. So, I settled on All Free and Clear, because it’s readily available and inexpensive. I do a very simple wash routine (short cold wash with a teeny bit of detergent, hot long wash with ½ the recommended amount, extra rinse only if there’s any remaining odor). Inserts and fitteds go in the dryer, pockets get hung on a drying rack in our bedroom. Once my kids start solids, I use flushable liners, because, again, I am going for simplicity, and I don’t have the time, energy, or desire to scrape poop. 4. Teach your husband how to wash diapers. No, I’m not joking. Even my husband, who gave the no-washing ultimatum, is a pro now. On my busiest weeks, he’s even been known to put in a load, unprompted. There’s nothing like coming home to your husband sitting in the middle of the living room floor, stuffing pockets. 5. Remember, you are not supermom. Cloth diapering does not have to be an all or nothing proposition. You may have times where you find yourself staring at a diaper-less baby and a full diaper pail. So, pull out that backup package of disposables—it’s OK, and it doesn’t mean you have to throw in the towel. 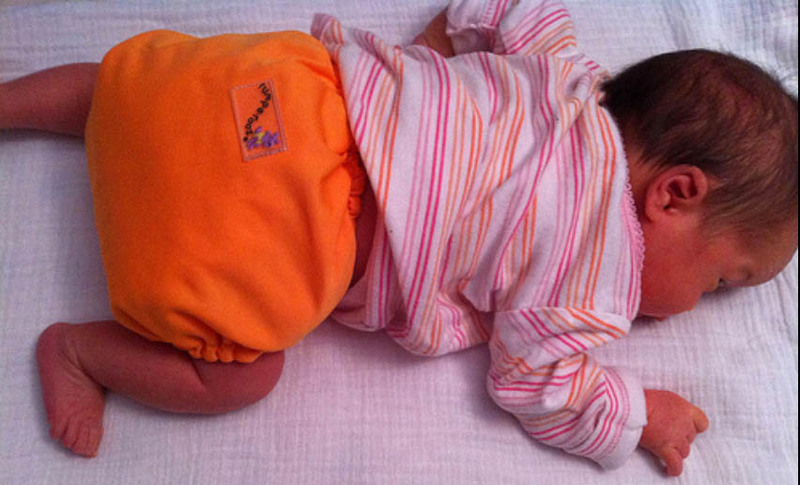 Every cloth diaper you DO use is one less disposable in the landfill, and that’s a good thing. When it comes to all parenting decisions, it seems like there is often one mode of thought or one avenue that is more popular than all others and most people fall in line, without researching on their own what might work better for their child. Cloth diapering is really no different. Many people start cloth diapering and gravitate toward one-size diapers – that is one-size-fits-all diapers that can be adjusted as your baby grows and typically fit babies from 7-35 pounds, give or a take a few pounds. However, just because of the popularity of one-size diapers, that does not mean that they are the only option! One other option is the sized diaper. As the name suggests, these diapers come in only one size: extra small, small, medium, large, or extra large. These diapers can be pocket diapers, fitted diapers, or all-in-one diapers. Popular sized diapers include the FuzziBunz Perfect Size and the Charlie Banana sized diapers. Each size fits the baby for a set number of pounds, when she grows out of them, the child just moves up to the next size. One of the best part about sized diapers is the fit. While one-size-fits-all diapers can fit your baby at any weight, they may not be the most trim option. The one size diaper has to have enough to it to allow it to fit through potty training, meaning it's going to be bulkier on a small baby. A size diaper often offers a more trim and custom fit! Of course, sized diapers can be a more costly option for parents, because baby will grow out of each size and you will have to size up. This means a lot more buying of diapers as the child grows. Keep in mind, though, that the diapers can be saved for a second child or, if no more children are in the future, the online resale value for cloth diapers is surprisingly high. Also, because you are not using the same diaper for 3+ years, the diapers will wear down more slowly! Plus, it is a rare cloth diapering parent that does not keep adding to their stash anyway, because everyone knows that cloth diapering can be a very addictive hobby! Whichever you choose, just make sure that is a thoughtful decision based on what works for your baby and don’t just stick to the norm if that is not the right choice for you! Guest blogger, Jessica, lives in the suburbs of Chicago with her daughter, husband and four cats. Although she didn't know anyone who cloth diapered when she got started, she loves the support and sense of community she now feels with other cloth diapering parents online. 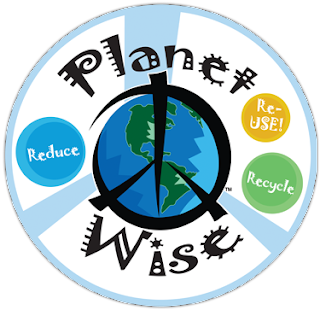 All orders placed on Sunday, June 17th will receive a FREE Planet Wise Snack Product!! Attention Local Dads, Grandfathers, Uncles, Brothers and Friends! Come take part in a nation-wide event to be known as the fastest cloth-diaper-changing-man in the land! All males are eligible, whether they are a proud papa, grandfather, friend or brother! The showdown starts June 16th and ends August 4th. 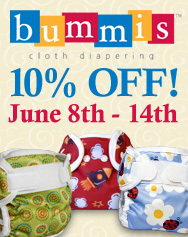 All participants in the CAN Challenge will be automatically entered to win one of 10 BumGenius Freetime Diapers! Any man who comes in and takes part in the CAN Challenge (can be any relationship to the baby) during the 1st week of the promotion will be given DOUBLE entries to the BumGenius Free Diaper Raffle and will receive a coupon for $5 off their purchase of $25 or more! I can still vividly picture the 1980's sloppy, urine soaked, brown cloth diaper being whirled around the toilet as I stood watching in horror. Water spraying from the toilet as the diaper made its rounds. And then, the disgusting, dreaded, wringing of the toilet dunked diaper. For that reason, I have always said, "I will NEVER use cloth diapers". That is, until the day I walked in to Nicki’s Diapers in Madison, WI to look at swim hats. The selection of swimwear is great, but the vivid patterns of Nicki's Planet Wise bags are what really sucked me in. Before I knew it, I had sidestepped half way through the store and was standing face-to-face with reusable diapers. Gulp. A pamphlet caught my eye and I read the following horrifying statistics… One baby is responsible for 2 approx. 2 tons of landfill waste from disposable diapers, which take 500 years to decompose, by the way. While I won't be granted sainthood for my green-ness, I do try to reduce and reuse whenever and however I can. Recycle at this point seems like a given. I started slowly asking questions to the girl behind the counter. She was super sweet and came over, picked up an adorable Best Bottoms Cover, snapped an insert in and we started chatting. Picturing the 1980's diaper, I brought up the whole toilet swirling thing. She smiled gently and said, "they have diaper sprayers now that you can attach to your toilet". Then I thought from a cost perspective, it must be super expensive if you have to keep purchasing different sizes. She informed me that the shells are all one size and the inserts come in 3 different sizes. They have overnight inserts that attach to the regular inserts for "overflow" protection. Washing instructions seemed very simple and the gross factor seemed to diminish the more we chatted. I remember thinking, I can certainly get over myself and touch a peed on diaper in exchange for my daughter to have a cleaner world. I have been cloth diapering my now 18 month old since she was about 2 months old. When I am away from home or when life gets too crazy to wash a load of diapers every 2-3 days, I do use disposables. While I am not proud of the landfill waste I have contributed with disposables, I am extremely proud of the waste that I saved with the BestBottom diaper system. I imagine just another piece of land that in the future will remain green and lush with trees and wildlife instead of a land with three eyed birds and condos built atop mountains of soiled diapers. My next personal goal for cloth diapering is to use them when we go out in public. I am sure that I can brave whatever will happen as long as I have a Planet Wise wet bag with me. Those things are awesome too! While speaking to the girl behind the counter today, we talked about chemicals that exist in disposable diapers. Yikes. It almost makes me want to become a Best Bottoms door-to-door sales person. Or, maybe I could be that crazy lady at the hospital that goes around trying to inspire new moms to use the system not only for the world, but also for all of the ways it benefits babies. They are cute, I have yet to have a stained insert and we aren't throwing away bags and bags of disposable diapers. So, just in case I didn't clarify how I feel about Best Bottom Diapers… I think they are great!!! Katy is a stay at home mom, a freelance graphic designer and artist who lives in Madison, WI with her husband, 18 month old daughter and two cats. She travels quite often and her new cloth diapering goal is to do it during short trips out in public so that she can work up the confidence to cloth diaper on long trips. Enjoy free shipping on diaper covers and all orders over $75 to the US! I decided on a small wet bag and matching changing pad, as I was tired of the bulky all-in-one changing systems I had previously been using. They weren’t flexible, they were heavy and they were huge! But as a new mom, I didn’t know any different from purchasing all of my baby needs at big box stores. The Small Planet Wise Wet Bag turned out to be perfect for my son and me. He wasn’t going through as many diapers as he had been when he was younger, and I was ready to get rid of my huge diaper bag. The small wet bag fit just what I needed to take my little guy out and about — two to three diapers, the matching changing pad and a travel case of wipes — and it allowed me to start carrying a purse again. My son is 15 months old now, and that wet bag has traveled all over the place. I’ve received multiple compliments along the way — from how cute and stylish the pattern is to how compact and easy it looks to use, people take notice, and I’m more than happy to say where I got it from and how great it has been in my life! When I’ve had to throw a wet diaper in the bag until I found a place to toss it, I’ve never had an issue with it leaking through to other items in my purse nor have I had to deal with a permeating funky smell. It’s been so useful in our life that with our second baby due in the fall, I’ve already purchased another wet bag and changing pad. This way I can still keep the bulky diaper bag at bay and give the kids a little flair in their diapering identity. Not to mention the ease that will come for both my husband and I with grabbing one little bag filled with all the diapering needs when either one of us takes only one of the kids out and about. About our Guest Blogger: Jenna is a freelance writer and editor who lives in Verona, WI, with her husband and 15-month-old son. They are expecting their second little one in late September. She looks forward to sharing her experience about transitioning to cloth diapers! Why wait till July to shop sales for Christmas toys?! 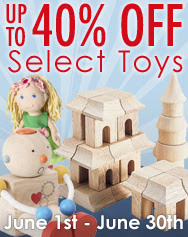 Find everything you need for the little ones on your list with our June Toy Sale!